[toc]Alcoholism is the leading cause of diseases like liver cirrhosis and gastric as well as kidney diseases. It is very important to overcome alcohol addiction. While counseling and professional help are necessary to combat alcoholism, it is also crucial that natural remedies be used. Herbal remedies are very effective in curing alcoholism. They help to reduce the urge to drink alcohol and they also fight stress and tension that comes due to alcohol withdrawal. Nervousness and anxiety which cause a person to drink, can also be eliminated through the use of herbs. Some of the best herbs to treat alcohol abuse include Kudzu, Schisandra, Celandine, Cayenne Pepper, Angelica, Passionflower, Hops, Valerian, Milk Thistle, Dandelion, Acorus, Khella, Wormwood and Aloe Vera. Pueraria Lobata is the Latin name of this herb. Kudzu is a Chinese herb which has been known to cure alcohol abuse and alcohol dependence. Isoflavones in Kudzu known as puerarin is especially effective in curbing the desire to drink alcohol, according to researchers. The starchy tubers and roots of this herb has been used in ancient Chinese medicine to curb dependence on alcohol. A plant estrogen called diadzin which is also an antioxidant inhibits an enzyme which is linked to alcoholism in humans. Due to its chemical constituents, Kudzu has been found by researchers to be as effective as medication in combating alcoholism. You can take this herb in extract or supplement form in order to control the impulse to drink alcohol. Acorus is another herb which is very efficacious in curbing alcoholism. Acorus Calamus is the botanical name of this herb. It acts as a restorative for the nervous system and the brain. It also improves appetite and fights nausea and fatigue caused by alcohol withdrawal. This herb is also known as Calanatts. An additional advantage is that this herb helps to relieve flatulence and indigestion that may result from acidity in the body caused due to excessive alcohol intake. This herb is available in the form of supplement or extract for safe consumption. 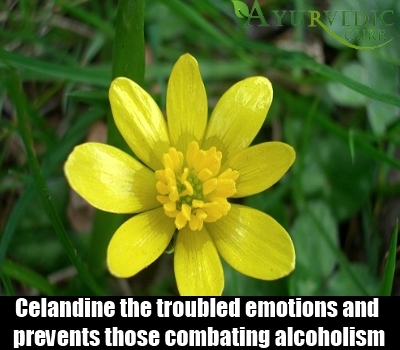 It helps during the acute stages of alcohol withdrawal in particular. It affects the brain and ensures relief from shaking and tremors which are experienced after a person quits drinking alcohol following alcohol abuse. Silybum Marianum is the botanical name by which this herb is referred to. The seeds of this herb have medicinal benefits for those combating alcoholism. Milk Thistle is very effective in removing alcohol toxins from the liver. Hangovers can also be treated using this herbal remedy. Milk Thistle also improves the ability of the liver to be able to remove alcohol from the bloodstream. You can crush the seeds of this herb and add it to a cup of hot milk. Drink this to curb alcoholism. You can also take this herb in the form of an extract. Silymarin which is an antioxidant found in this herb is also very effective in promoting the growth of new cells in the liver and fighting liver damage caused due to alcoholism. The botanical name of this herb is Schisandra Chinensis. This herb is native to China and it is also a very effective herbal cure for alcoholism. It can help in improving concentration and focus in alcohol addicts who want to quit drinking. This herb also aids in enhancing mental clarity and immunity. It contains a substance called lignans which are very vital in eliminating alcohol dependence. Alcoholism can be fended off using this herbal remedy. Schisandra also helps to lower stress levels in recovering alcoholics. This greatly influences the ability of people recovering from alcoholism to control their alcohol cravings. You can take this herb in extract form for good results. Capsicum Frutescens is the Latin name of this herb. Cayenne Pepper improves the appetite and relieves nausea experienced during alcohol withdrawal. It also lessens irritability and calms the recovering alcoholic’s mind. Cayenne Pepper is especially effective for reducing delirium tremens or the side effect of alcohol withdrawal where a person experienced shaking, chills and crawly sensations all over his or her body after quitting alcohol. You can crush Cayenne Pepper pods and add them to dishes. You can also consume this herb by using it as a seasoning for salads or soups. Add some Cayenne Pepper to a hot cup of water and drink this for good results. Khella is a herb which has been used by the Egyptians as a medical remedy since ancient times. This herb is also used in the Ayurveda medical system. Also called Toothpick Plant, this herb is beneficial for eliminating alcoholism. The fruits of this herb contain special healing properties. This herb is very effective in dispelling the short as well as long term effects of excessive alcohol consumption. It is also an antispasmodic making it very effective for relieving stomach cramps and indigestion experienced following the cessation of alcoholic intake or the acidity or hangover caused by excessive drinking. You can brew a tea using the fruits of this herb and consume it regularly for relief from the symptoms of alcohol withdrawal. Khella also curbs the toxicity caused in the body due to years of excessive drinking by alcoholics. It is a very effective remedy for recovering alcoholics to stave off alcoholism. Passiflora Incarnata is this herb’s botanical name. This herb is very effective in calming and relaxing the mind. It lowers stress levels and curbs stress induced alcoholism in people. Passionflower also assists in reducing the impact of withdrawal from alcohol. It curbs insomnia and sleep disturbances in people who have quit alcohol. It also fends off delirium tremens and spasms and shakes experienced during alcohol withdrawal. Drink Passionflower tea brewed from the leaves of this herb for easing the problems faced while fighting alcoholism. Chelidonium Majus is the botanical name given to this herb. It is very good for detoxifying the body in persons who have quit alcohol. It also cures liver related problems that stem from excessive alcohol consumption such as liver cirrhosis. It soothes the mind and prevents recovering alcoholics from becoming depressed or extremely angry. It calms the troubled emotions and prevents those combating alcoholism from going into a stressed and emotionally unstable state. You can take this herb in the form of extract or supplement to overcome the effects of quitting alcohol such as dullness and emotional turbulence.